Hypertufa containers filled with succulents on a drylaid, raised bluestone patio. STOVE/FIREPLACE? - I'm assuming that it was custom made (stove/grill) I love it! All those oven doors are excellent as warmers as well as for cooking. Who made it and what company can I make inquires? Wow..you did a beautiful job. That is the kind of grill I would like built. Thank you for the info. Planters - Do you sell those pots. I don't sell those pots. They're hypertufa and relatively easy to make. OK, this is kinda awkward...but doesn't this REMIND anyone of something?!? Are these outside fireplace clean outs or? Looking at the other photos, this all appears to be a fairly sophisticated woodburning outdoor cooking setup. Typical cleanouts, or ash doors, are usually about 8"x 8" and cast iron, like the little door above all the rest of the double doors. It was built in the 1920s. Yes wood burning and those are clean outs. What weather will this grow in northeast in winter. These are hardy in the Northeast. They're Sempervirens. LECTURE — 10: 30 a.m. Jan 21, 2012Cacti and SucculentsGethsemane Garden Center in the Greenhouse5739 N Clark Street, Chicago, ILIf you're looking for an extra dose of green this winter, join Ted Biernacki of Ted's Greenhouse as he discusses the benefits of planting and how to care for cacti and succulents. Whether you've already got a saucer full succulents or just want to slow down and daydream about spring, you'll walk away with practical tips on propagation and rooting, repotting and the ideal soil mix.Limited space available. RSVP at (773) 878-5915 or greenhouse@gethsemanegardens.com. Aloe, scilla, gasteria and haworthia are a few examples of succulents that thrive in the hot, bright summer sun. If you're looking to increase the beauty of your outdoor scape, consider planting flowering Autumn Joy — which not only is pretty in its own right but also attracts butterflies. But in this photo, the concrete is left rough and rustic, giving a casual and well-worn appearance. As this material is practically indestructible, you'll have concrete containers around for years and years. The patio is about 10 inches off the ground on this side. 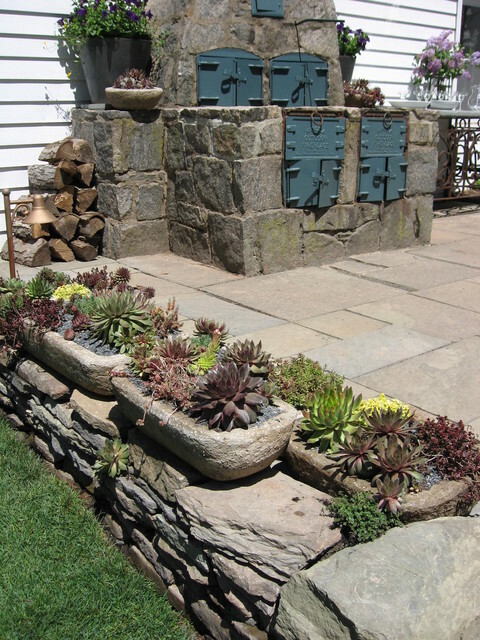 Hypertufa pots containing sempervirens, sedums and thyme sit atop a new Pennsylvania fieldstone wall. The patio is full-range bluestone in an ashlar pattern with a thermal finish. Cohan was also able to incorporate some bluestone flagstone found onsite; if you squint you can spot the pieces surrounding the grill.